Lieutenant Eve Dallas puzzles over a bizarre suicide bombing in a Wall St. office building in the latest in the #1 New York Times bestselling series…For the airline executives finalizing a merger that would make news in the business world, the nine a.m. meeting would be a major milestone. But after marketing VP Paul Rogan walked into the plush conference room, strapped with explosives, the headlines told of death and destruction instead. The NYPSD’s Eve Dallas confirms that Rogan was cruelly coerced by two masked men holding his family hostage. His motive was saving his wife and daughter—but what was the motive of the masked men?Despite the chaos and bad publicity, blowing up one meeting isn’t going to put the brakes on the merger. All it’s accomplished is shattering a lot of innocent lives. Now, with the help of her billionaire husband Roarke, Eve must untangle the reason for an inexplicable act of terror, look at suspects inside and outside both corporations, and determine whether the root of this crime lies in simple sabotage, or something far more complex and twisted. Boonsboro, Maryland resident famous author, Nora Roberts has been writing suspense novels very successfully, under the pseudonym of J. D. Robb since 1995. Her first In Death series book was Naked in Death, to which readers were immediately attracted to the main character…Eve Dallas, and her love interest…Roarke. Since the book in the series in 1999, Loyalty in Death, every Robb novel has been included on the New York Times bestsellers list. 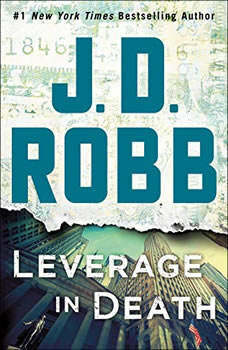 Many of Robb's fans were suspicious that Roberts and Robb might be one in the same, and those suspicions were verified by her twelfth book in 2001. Some of Robb's biggest fans are other famous mystery writers, such as the likes of Stephen King and Jonathan Kellerman......pretty good critics! The In Death series will continue as long as Robb wants to keep writing the novels. She has said that if Eve has a child in a novel, that will be a signal that the series is concluding.